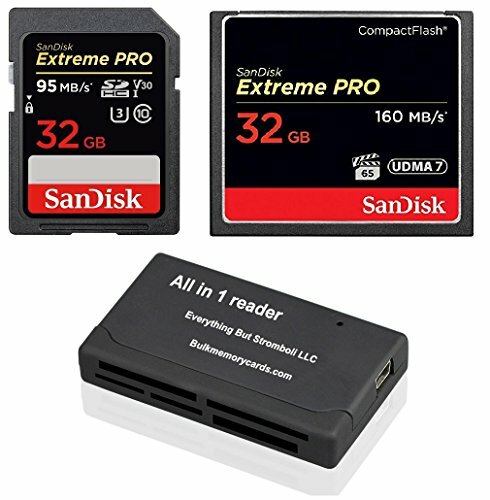 This bundle includes a SanDisk CF Extreme Pro CompactFlash Memory Card, a SanDisk SD Extreme Pro Memory Card, and an Everything But Stromboli All-in-One Card Reader (includes CF slot and SD slot). SanDisk products are constructed to the good standards and rigorously tested. You can be confident in the good quality, performance and reliability of every SanDisk product. This bundle is ideal for Cameras that have a CF slot and SD slot, like the Nikon D300s and D800 DSLR Digital Cameras. The CompactFlash card has transfer speeds of up to 160MB/s. It is also UDMA 7 enabled. The Sandisk Extreme Pro CF Memory Card can operate in temperatures ranging from -13 degrees F (-25 degrees C) to 185 degrees F (85 degrees C).